The Islander Villas feature a luxurious and spacious four bedroom, (1700 sq.ft.) four bathroom floor plan with a unique "Lock Out" feature allowing both personal and rental usage. 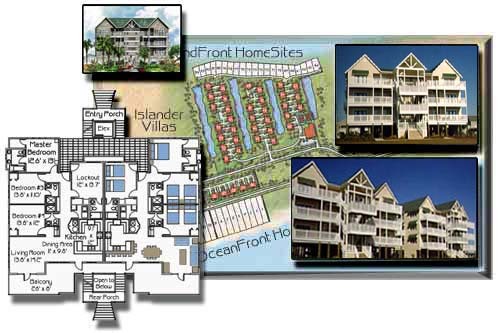 They are located in the Islander Resort, a planned development at the secluded west end of beautiful Ocean Isle Beach. 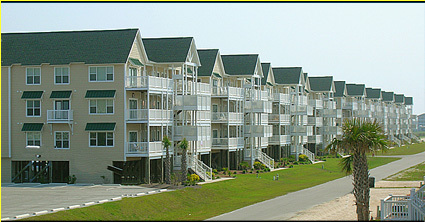 The Islander Resort has a magnificent Beach Club and wonderful, park like green areas for your enjoyment. Each 3 story building has 2 villas per floor, served by a common elevator. Expansive exterior decks feature breath taking ocean and sound views. Must have QuickTime Plugin Installed: Need Help? No compromise has been made in the design and construction of these units. Structural integrity begins with 2 X 6 exterior wall framing filled with R - 19 insulation. Adhering to the strictest standards have made the ideal a reality. All materials used on the exterior of your luxury Villas have been selected to compliment care free ocean front living. From the low maintenance, high wind resistant, interlocking vinyl siding and deck railings, to the Hatteras roofing shingles the attention to lasting quality and detail has been our only focus. Function and quality are the focus of the kitchen and baths. The kitchen features a deluxe GE appliance package, solid, raised panel, MarKraft cabinets, and custom made counter tops and a ceremic tile floor. Many terrific meals can be prepared with comfort and ease while enjoying gorgeous sunsets. Each Villa has 4 full baths with ceremic tile floors, Delta faucets, oversized mirrors, and cultured marble vanities. The master bath features a whirlpool bathtub. Your living room features 9 foot ceilings, atrium doors, and is surrounded by large windows allowing the beach experience to continue while you enjoy the comfort of your new Villa. An energy efficient Bryant heat pump guarantees comfort no matter what season. The "Lock Out" unit even has its own GE Zoneline heat pump allowing separate temperature settings. No detail has been lost when thinking about your safety. The Villas have an overhead sprinkler system which even covers the ground level parking. An automatic dialing feature has been added for additional peace of mind.